We are a small nursery specialising in garden worthy herbaceous perennials for a nature friendly garden. For a small nursery (more accurately a micro-nursery) we have an incredible range of home-grown plants including large collections of Helenium, Centaurea, Salvia, Geum, and our other passion, Phlox as well as many other interesting and beautiful plants. Phlox are rarely offered by nurseries these days except a limited range of mass-propagated types. We are collecting together a lot of old or local varieties and growing these at our garden. Come along to a fair in spring and be treated to a great choice of Phlox. All our plants are hard grown in the open as we think this gives a better plant to establish in your garden. We don't force things on in polytunnels and greenhouses. You can order plants to be brought to an event at no extra charge and it is always advisable to ring or email to ask us to bring the plants you want as we can't bring our full range to every event. With over 1000 varieties of perennials growing in our garden we have a great range of plants to bring to events. Perennials for late colour feature strongly in our range throughout the year. This is one of our October borders. 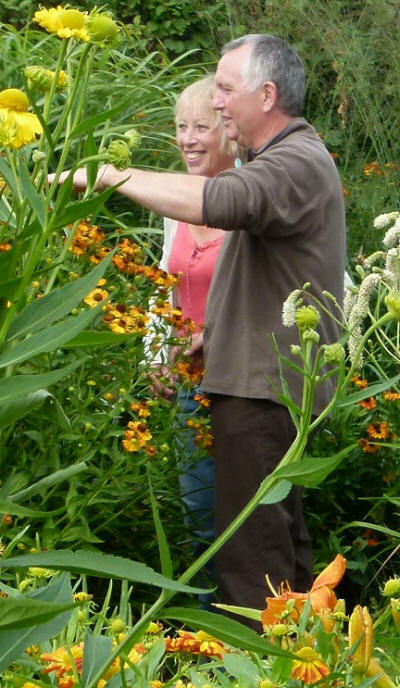 Carol Klein and the BBC Gardener's World team came to our garden to film our Heleniums in 2014. (Broadcast 29 August 2014).